Seems like the entire blogging world is in a fervor about the new CS3 icons. Check out Daring Fireball for links to just about every relevant conversation going on right now on the subject. My take on it: Yeah, the icons are pretty ugly. Just a little bit boring. I really like the direction they’re going in though, because I was honestly never a fan of the older CS-era icons. Sounds like most people agree that the CS icons were pretty, but useless as far as remembering which icon belonged to which program (I’m forever opening up Illustrator or InDesign by accident). I like how the icons bring together the suite, but overall it doesn’t seem quite right yet. The Acrobat icon choice is understandable, but it’s still just plain goofy when you put it next to all of the other. Overall, it feels like a rough idea that could be headed in the right direction. Here are some pictures of my latest project. It’s still a work in progress. I’d say it’s about half to 2/3 done so far. I’m excited. There will be some assembly. 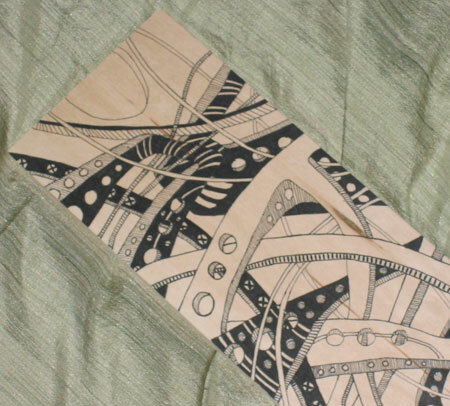 I’ve been drawing on wood for this project and I have to say, I really like it. It feels very organic. 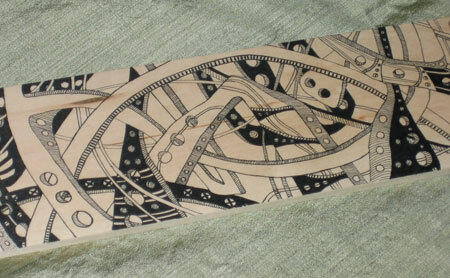 I also like the color of the wood and also how the wood grain shows through.